There are a huge number of different funding organisations throughout the UK who offer financial help to schools and clubs for sport surfacing construction projects. 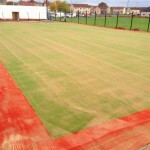 Needlepunch funding can be used to build a number of different synthetic turf sport surfaces including multi use games areas, athletics tracks and long jump runways which can all improve the sports facilities of any organisation. Schools and clubs which successfully apply for needlepunch funding can be offered a grant to construct a sports facility which suits their requirements without having to worry about budget restrictions. 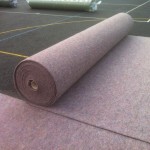 Needlepunch fibre bonded sports surfacing provides great performance qualities for a range of sports including football and hockey, it is also extremely durable and long lasting meaning it can withstand a lot of heavy use. Inlaid line markings can be installed within the turf carpet in contrasting colours to make the facility a multi use games area. 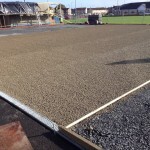 Primary schools often choose to have needlepunch synthetic surfacing installed for athletics tracks instead of the traditional polymeric rubber as the needlepunch gives a softer landing surface to protect younger children from trips and falls. 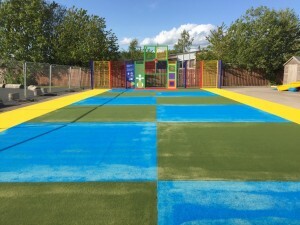 The fibre bonded synthetic surfacing can also be installed in a variety of colours and rainbow designs to make sports and athletics even more fun for kids. We aim to provide top quality products and services for all of our clients and we are happy to help with every aspect of the installation process including needlepunch funding advice, full construction and after care maintenance. 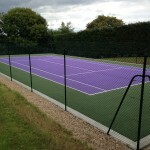 You can find out more about all of the needlepunch surfacing specifications and the other sports facility services we provide by looking through the rest of our website. If you’d like to send us an enquiry or you need advice about needlepunch funding, please fill in our contact form with your details and we’ll get back to you with some helpful information about prices, quotes and specifications.